Continuity mistake: Keith gets slashed on the back of his LEFT shoulder by Prince Lotor but later when Keith says "Heck, it's just a scratch" he is holding his RIGHT shoulder. 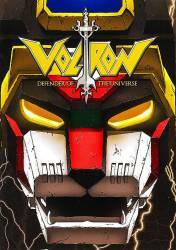 The company that adapted "King of Beasts Go-lion" (Lion Force) and "Dairugger" (Vehicle Force) into "Voltron: Defender of the Universe" also wanted to dub another anime robot series called "Lightning God Albegas," but for some mysterious reason it never did. Some people speculated that the sexual perverted behavior of one of the major characters from Albegas, or the unaesthetic appearance of the six-armed robot may be the reason why the series was never dubbed. Interesting enough, toys based on Albegas were sold under the Voltron name.